Here’s a fantastic HOW-TO video from Nick Engler that shows you, step-by-step how to align your MARK V’s major components quickly and easily so you can achieve the very best results on all of your projects. No more fiddling around… no more guesswork. Just the facts ! 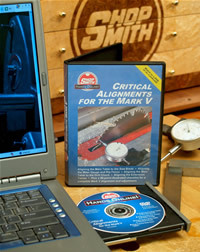 Since most projects begin with sawing your workpieces to size, this is the most important of all alignments. In this segment, you’ll learn how to set your Worktable Miter Gauge slots to be parallel with the axis of rotation of your sawblades. In this segment, Nick shows you how to be sure your Rip Fence is parallel with these slots…and your Miter Gauge face is perpendicular to them. He also shows you how to set the two 450 stops on your Miter Gauge. In this segment, you’ll learn how to be certain that your Drill Chuck is aligned perfectly with the Worktable surface…both front-to-back – and left-to-right. Only be doing this, can you be sure that the holes you drill, grooves you rout, edges you Drum Sand and more are at the desired angle to your workpiece surfaces and edges. Since your Rip Fence can be used on these Tables as well as your Main Worktable, it is critical that they be in perfect alignment with the Main Worktable. In this segment, Nick shows you how to make the adjustments that will ensure the precision of your rip cuts and other operations that may rely on the accurate positioning of your MARK V Rip Fence.